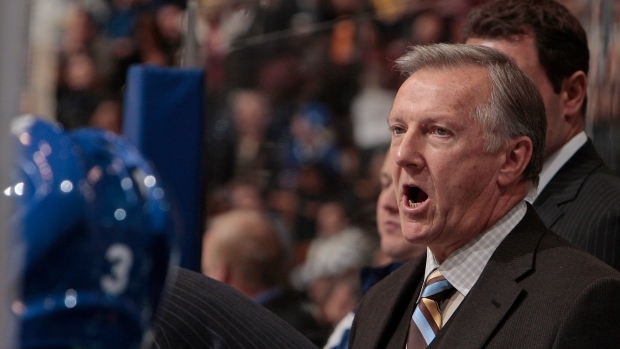 Former NHL coach Ron Wilson is recovering from a recent stroke, according to a report Wednesday from the Los Angeles Times. Wilson is currently in rehabilitation, according to the report, which cited information from friends. The usually private coach has sent text messages to friends indicating he is 'OK' and is expected to make a full recovery, but has not relayed more details. 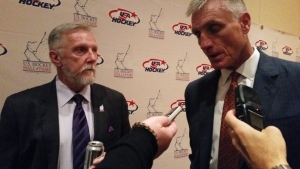 Wilson, 61, made an appearance in good health in Philadelphia on Nov. 30 when he was honoured by the U.S. Hockey Hall of Fame for coaching Team USA to the 1996 World Cup of Hockey. Only six men have coached more NHL games than Wilson. He spent parts of 18 seasons as an NHL head coach from 1993 through 2012 as the first-ever head coach of the Anaheim Mighty Ducks along with stints in Washington, San Jose and Toronto. He compiled a 648-561-101-91 record over 1,401 games and led the Capitals to the Stanley Cup Final in 1998. Wilson’s last stop was with the Maple Leafs, where he went 130-135-45 from 2008-12. The Windsor, Ont.-born and Rhode Island-raised Wilson also played 64 games with the Maple Leafs from 1977 to 1980. Most recently, Wilson served as head coach of Team USA’s entry in the 2016 World Junior Championship. The Americans, paced by Auston Matthews, captured bronze in Helsinki, Finland. Wilson also coached Team USA in the 2010 Vancouver Olympics, ending with a heartbreaking finale thanks to Sidney Crosby’s gold medal-winning goal in overtime. Wilson briefly joined TSN as an analyst in 2015. He resides in South Carolina.